Janus had peeked over himself, looking a bit more cautious and ginger about it. “Well, it looks like any old well, except there’s no water. Smells horrible, too.” He pinched his nose momentarily, trying to wave the smell away. She started to find a spot to fasten the rope. It was a long bit from the blacksmith, about ten yards or so. Heather had no doubt that it’d reach the bottom. In her estimation, it was about fifteen feet deep. Heather found an iron loop (two in fact) on opposite sides of the well’s exterior. She did a double square knot to keep it in place, looking back over the edge. “Here, pass me the lanterns.” Heather motioned for the lamps as she picked up the other end of the rope. Janus complied without any comment, observing her tie the two by the handles before reaching back over the well. Heather stretched her arm out, letting the lanterns dangle before easing them into the well. The rope passed through her fingers as the lamps reached the bottom a moment later. She had tied knots and footholds every foot or so. It wasn’t uniform, but it was better than nothing. Yanking on the rope to test its security, she took a deep breath and stuck a leg over the edge of the well. “Don’t fall,” Janus warned. Concern was on his face as he tried to see what she was doing. Heather didn’t answer, managing to place one of her feet into the footholds. Grabbing another with her hands, she pulled herself over. She hung from the rope as she struggled to see where to put her foot next, slowly letting go of her grip with one hand and starting her descent. Admittedly it didn’t go as fast as she liked. Her dress made it hard to see where to step next, and despite having done “chores”, she was out of breath in a few moments. By the time she reached the bottom, a few moments had passed. When her foot sunk into the soft dirt, Heather glanced around. It didn’t seem that dark down here. Some bedrock was visible, the puddle she had seen from above not too far from her. It was damp and cold. She stumbled from her workout, leaning against the wall to catch her breath. She looked up, seeing Janus gazing down at her from above. “Come on!” She motioned for him to come down. Janus didn’t answer. At first she was certain that he would not even follow her down. By the time she had untied the lanterns from the end of the rope, he had scurried down most of the way. Her companion was quiet as she had lit one of the lamps from matches in her apron pocket. He patiently waited for her to light the other, taking the large one his mother typically used. Heather was left with the smaller mining lantern, which also belonged to the family but rarely used. “There’s not much to look at, huh?” Janus stepped away, lifting his lantern to illuminate the bottom of the well. With the two of them there, there wasn’t a lot of room to do much except stand, much less anything to discover. “No, there isn’t.” Heather was a bit confused. How was something horrible supposed to be at the bottom here? She could certainly understand how a small boy could fall to his death or be severely injured from falling in. But a screaming voice out of a well didn’t make sense. “Mud, bedrock….huh. Look!” Janus stomped his foot down on the muddy spot. His heel made a dull knocking, something rock and dirt didn’t make. The youngsters dug away at the dirt, using their feet to push the soil aside. Planks came into view, buried beneath a scattering of dirt thin enough to hide them. “They might give way. Don’t stand directly on them.” Heather tugged Janus back. Her eyes watched how the wood ran, attempting to determine and edge. She put her lantern down, fingers digging into the dirt and yanking up a large plank. A portion of a hole was revealed upon doing this. The smell that they had smelled earlier was much stronger now, emanating from the covered spot. “Another hole…I wonder if the workmen dug this out.” Janus mused. Heather’s arms shook a little, dropping the plank unexpectedly. She reached for the rest and pulled them away, a total of three planks covering the opening. She and Janus were silent, nothing but their breathing audible as they crouched and peered inside. The hole was a rough round opening two feet wide, an old ladder nailed into the bedrock. A current of air blew upwards, causing a low droning whistle. “It looks too natural. I see pieces that look smooth, but I think they ran across this when they were digging.” Heather’s voice was low. She was certain that something was there. If Janus was right, the people who worked on the well must’ve sealed this hole up to prevent something from getting in…or from getting out. But what if that thing in my dream is down there? What if it gets me, or hurts Janus?! Should I go any further? “Do you think its safe?” Heather asked Janus. She honestly was a bit afraid having come this far. Her heart (and perhaps her stomach) knew that something was wrong. They were at the doorstep of something that a young woman and boy weren’t supposed to be meddling with. She swung her feet into the hole, realizing how inconvenient her shapely work dress would make her descent. Heather did her best to stuff it into the hole, making sure her feet had a good foothold on the ladder before starting down. Her mind had a thousand thoughts going through her head as she took step after step, frequently having to push her dress down to avoid snagging. She was mainly concerned about their safety; Heather had not expected to actually find something at the bottom of the old well. She dreaded what lay in wait at the bottom; whether it was an actual nightmare or a hazardous place. Heather came back to reality, realizing that this was really a long descent. She looked up to see that Janus’ light was a distant flicker. She must’ve crossed forty feet or so. About fifteen rungs later, Heather nearly had a heart attack as the tunnel opened up, her foot missing the spot where the next rung would’ve been. She clung to the ladder in fear as eased herself down slowly, foot kicking and feeling if the ladder continued. Her skirts fell into place as her heel scraped smooth limestone, eventually finding a footing on gravel. Heather squeezed her eyes shut and let go, her heels planting themselves against the loose stone. When she didn’t feel herself fall to her death, she opened her eyes and let go of the ladder. “Are you okay?” Janus called down. His voice was a bit faint, echoing within the passageway. Heather didn’t answer, raising her lantern to examine the new space around her. Her heart thumped in her chest, feeling locked in as she realized that the area she stood had a low ceiling that barely touched her head. The space stretched out in all directions, stalagmites and stalactites everywhere. The air was stale, bothering her lungs. The lamp cast numerous shadows, the flickering flame causing them all to move at once. “Heather!” Janus called again, a bit louder. Please do. Heather was jittery, fighting the urge to scramble back up. The air moaned, making her blood run cold as she grasped onto the ladder for comfort. She couldn’t determine where to go next; she could faintly make out a wall in the distance. It seemed to take an eternity for Janus to finally arrive down besides her. A sigh of relief left her lungs as she saw his familiar face, almost certain she looked grateful. 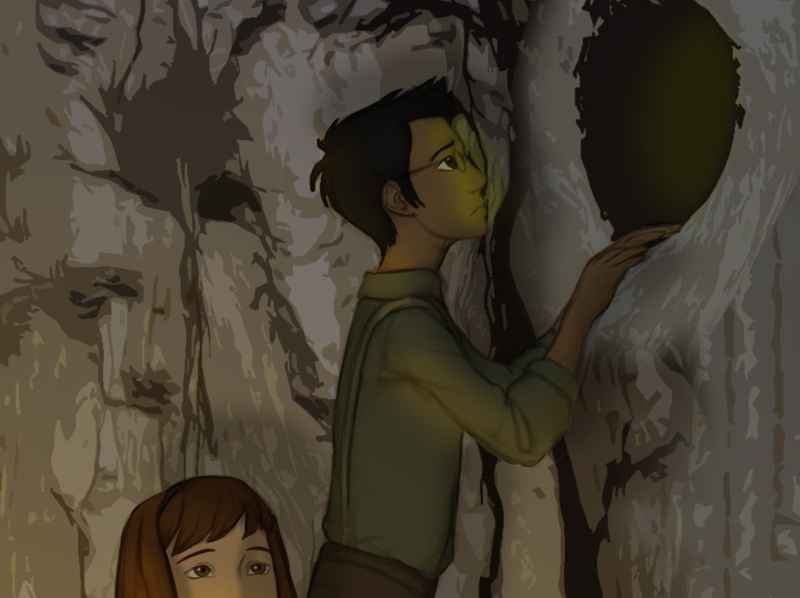 “There is a cave in Ellowwood after all.” Janus was incredulous, turning around completely in place. Heather absentmindedly grasped his arm, trying to look she had done it as natural as possible. Janus gave her a judging glance before looking up at her. “A little.” She squeaked, feeling her cheeks burn. That didn’t make her feel better as Janus frowned, tugging out of her grasp. However he didn’t walk away. He took her hand instead, pulling on her to follow along. Heather followed without qualm, holding his hand tightly while working on gathering up her courage after coming this far. She had to crouch a little to avoid banging her head on any rocks. Just as she had seen, there had been a wall in the distance. The entire space was a round chamber, the only way to proceed forward being a large crevice. The wind blew in the youngster’s faces with varying degrees of force, with the strength of a medium breeze. Heather could smell the air was clear, laced with water and something else she couldn’t determine. Her hair stuck to her face as Janus pushed the lantern inside. “Goes into a passageway. There must be an opening up there where air is coming down from the surface.” He checked to make sure the ground was safe before stepping in. He easily fit for being a small boy. Heather had a little bit more difficulty squeezing through but made it without any serious issues. Her lantern flickered because of the moving air, thankful that Janus’ lantern was resistant to such things. The passageway went along for a short bit; tall but narrow. Heather didn’t spy anything out of the ordinary, wondering how far this cave system carried underground. She realized she completely forgot to keep how much time went by. She didn’t want to spend hours beneath the ground, much less be home at night and scolded by Elizabeth. She nearly stumbled into Janus when he realized that they had come to yet another crevice. This opened up into a smaller chamber with a high ceiling. The wind that they had felt at the initial entrance was here once again, howling as it blew around them. “A dead end…” Heather could see where else they could proceed. However there were several large holes in the walls of the chamber, most of them several feet above them. “That’s where the cave must connect to the surface,” Janus noted. He pointed to one of the holes, no bigger than his lantern. “Yeah…” Heather’s feet were rooted to the ground, her heartbeat quickening. Something seemed out of place. She couldn’t tell what it was immediately, but it hit her that there was a smell in the air for a brief moment. That rotten sulfur-like smell she had noticed when they pulled the planks up earlier. Just like that it was gone again, leaving the musty cave interior. There was a tug on her sleeve, causing Heather to nearly jump out of reflex. It was Janus, pointing to something in the cave wall. “Look…” He looked somewhat mystified, a puzzled look on his face. There was a large hole that she hadn’t noticed earlier about seven feet above them. It was larger than the others, almost as narrow as the shaft that had led down to the lower cave. Inside was a soft green light. “A light? What could…” Heather tried to tiptoe to see, but was unable to reach to see. It was simply too far above her head. “Here, let me look. Help me up.” Janus placed his lantern on the ground. Heather laid hers down as well, cupping her hands together. She bent down to give Janus a foot up. Janus raised his leg and placed his foot in her grasp, standing up. She bent her knees to absorb his weight. 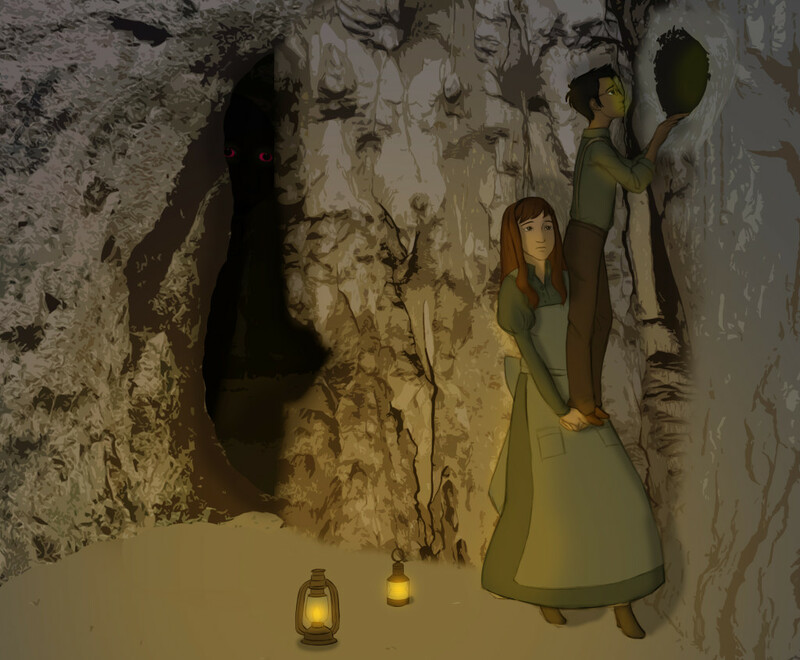 Janus held onto the wall for balance, his hands grasping the edge of the hole to peep in. Heather grunted softly and tried to support him, looking up to check his progress. “Oh Janus, be careful!” Heather pleaded. She knew that if he got stuck or hurt, there was absolutely nothing that she could do to help him. Janus started to scramble up, his free foot kicking for a foothold. Heather hoisted him up to the best of her ability as he wriggled himself inside. He seemed to fit but it looked like it was tight. “It’s a ways in. Looks like a rock.” Janus’ voice was muffled. His feet started to disappear inside the hole. “Don’t get stuck; if you can’t fit, don’t go further!” Heather warned. It sounded like Janus responded but she couldn’t positively tell. Her body was tense and nervous, realizing that she was spiraling downwards into a mess of events. It was so easy to make a small slip-up and both of them could get hurt easily. Heather hadn’t even been truthful to him why she was down here. She was beginning to second-guess her decisions for that day. Heather secretly hoped that wouldn’t be the case.